The graph above shows the level of electoral support for British political parties by ideological self-positioning, based on wave 10 of the British Electoral Study (data collected in November and December 2016). I have left out people who refuse to place themselves. The curve obviously declines as you go right for Labour, and increases for the Conservatives (with a decline on the far right as UKIP goes up). What is the most interesting is the slope of the two main parties: electoral support for Labour declines faster as you go right, and the Conservatives rise earlier, meaning that the Conservative are stronger on the center ground. The Conservatives do much better than Labour among people who consider themselves in the very middle of the political spectrum (that is, choose a 5 out of 10). 27% of voters in this category intend to vote Conservative, against only 18% who plan to vote for Labour. As the histogram below shows, this is the largest category of voters in the electorate, among those who are willing to place themselves (23% don’t). The sample is 30’319. This entry was posted in General Election, Political Science, United Kingdom and tagged Conservative party, labour on May 15, 2017 by alexandre afonso. A new European Parliament has been sworn in on July 1st, with a greater number of populist Eurosceptic MEPs than ever before. Out of the 751 seats in the European Parliament, 48 are now held by the Europe of Freedom and Direct Democracy group, uniting essentially Nigel Farage’s UKIP and Beppe Grillo’s Movimento Cinque Stelle, while 52 are held by non-affiliated parties such as the French Front national, the Dutch PVV or the Austrian FPÖ. After the success of UKIP or the Front National, many media outlets have mentioned earthquakes, landslides and other geological metaphors to describe changing power relationships that would allegedly change the face of Europe. However, in a political system where alliances and cooperation across political parties at different levels are fundamental, the eurosceptic populist right remains badly connected and deprived of access to power. 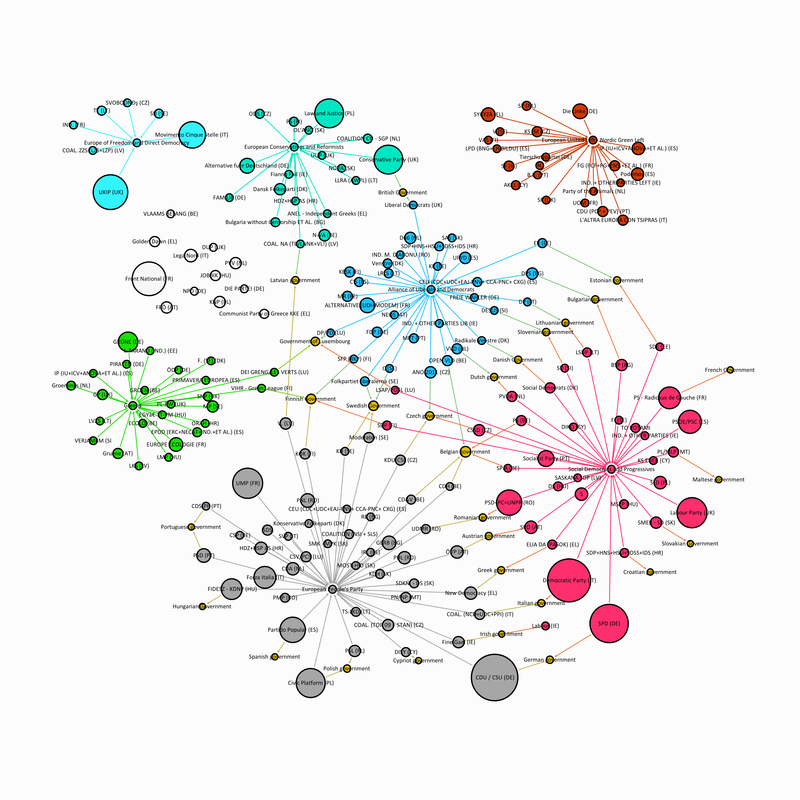 In the picture above, I have represented the European political system as a network of political parties connected to each other both transnationally and domestically (high version here). The nodes in the network represent all political parties that obtained seats in the EP in the last European elections, and their size is proportional to their number of seats. Transnationally, they are connected via their membership in the European political party groups. These groups broadly correspond to the traditional party families: the Social-Democrats (Alliance of Social Democrats and Progressives: Labour, German SPD, Italian Democratic party), the centre-right (European People’s Party: the German CDU, the Spanish PP, the French UMP, Forza Italia), the Liberals (Alliance of Liberals and Democrats for Europe: Libdems), the Greens, the Radical Left (United Left: Syriza, Podemos), the Conservatives, and Europe of Freedom and Democracy (UKIP and Beppe Grillo’s Movimento Cinque Stelle). Many of these parties that cooperate transnationally with like-minded parties are also engaged in government coalitions with other parties at the domestic level. For instance, the German SPD, who is a member of the social-democratic political group, is in a coalition with the CDU, who is a member of the European people’s party. The British Conservatives, who belong to the European Conservatives and Reformists, are in a domestic coalition with the Liberal Democrats, who are a member of the Alliance of Liberals and Democrats for Europe. Knowing who is connected with whom is interesting because it can play a role in coordinating domestic and European policies. In the case of the CDU and SPD, the fact that two of the largest parties in the European Parliament are in a coalition together at the domestic level can provide a strong action power to promote policies. Unsurprisingly, social-democrats and the European People’s party are well connected via a number of domestic government coalitions. Such “red-grey” coalitions are in place in Romania, Germany, Austria, Greece and Italy. What is perhaps more surprising is the prevalence of liberal/social democratic coalitions, making the Liberals a well-connected party family in spite of their relative electoral weakness. Such coalitions are in place in the Netherlands, Denmark, Slovenia, Lithuania, Estonia and Bulgaria. In fact, network measures of centrality indicate that Liberals parties are even better connected than the Social Democrats. This is essentially due to the fact that the size of these parties doesn’t allow them to govern alone at the domestic level, and they are therefore forced to coalesce with other parties to be in power, increasing their connectedness. Finally, grand coalitions uniting social-Democrats, Liberals and the centre-right, sometimes with other parties, are in place in Finland, Belgium, and the Czech Republic. Coalitions between centre-right and liberals are rather rare, and only observable in Sweden. Compared to the days of red-green coalitions in Germany, Green parties appear as weakly connected, with members taking part in coalitions only in Luxembourg and Finland. The British Conservatives, by deciding to leave the EPP in 2009, have given up on substantial connections in the sense that their partners in the ECR are mostly small and badly connected, with the exception of their Polish (they are not small) and Latvian (they take part in government) partners. Moving to the Eurosceptic right, in spite of their electoral success, these parties appear clearly isolated, with no link to any coalition government at the moment. This is true both for the parties that failed to form a political group of their own (Marine Le Pen and Geert Wilders did not manage to find partners in a sufficient number of countries), but also for UKIP, whose partners in the “Freedom and direct Democracy” group are not connected to any relevant party in power. This is also true for the radical left group, in the upper right corner. Hence, in the absence of the connections and access to power that the mainstream parties possess, the “earthquake” that the media has been talking about is very unlikely to happen. A version of this post was published on the European Politics and Policy blog. This entry was posted in European Union, Political Science and tagged European Union, networks, parties, populist-radical right parties on July 5, 2014 by alexandre afonso. The final of the UEFA Champions that will take place in Lisbon on May 24th is remarkable for a number of reasons: it will oppose two teams not only from the same country, but from the same city (Real and Atletico Madrid), none of which actually won the Spanish Liga last year (FC Barcelona did). Such a final would have been impossible in the 1980s and early 1990s, when only the winner of each national league was allowed to take part in the most prestigious European club competition. In 1986, Steaua Bucarest won the European Champions Clubs’ Cup, as it was called then (against Barcelona, on penalties), and in 1991, the Red Star Belgrade won against Marseille, again on penalties. Nowadays, it would be difficult to imagine Red Star or Steaua winning the competition, partly because it has become much more difficult for the champions of low-ranked national leagues such as Romania or Yugoslavia to actually make it to the group stage. This year, Steaua Bucarest had to go through two qualifying stages to make it to the pool stage; the Romanian league is granted one representative, providing it makes it through the qualifying rounds. By contrast, up to 4 teams of the best – and richest – national leagues (England, Spain, Germany) can take part in the Champions League, and they will have up to 5 or 6 clubs as from 2015. In total, up to 7 clubs from each of these countries currently take part in Continental competitions, Europa league included. It is true that if the share of the cake of rich countries has expanded, the size of the cake has also increased with the multiplication of participants in the competition (from 16 teams in the group stage in 1996 to 32 teams in 2013). However, what we have witnessed over the last 20 years is a considerable movement of concentration where the richest clubs are almost guaranteed a spot in the Champions League and its huge TV revenues, while the league winners of smaller football nations have to go through a number of hurdles to access it. How can we explain this evolution? Until 1992, the European Champion Clubs’ Cup was a straight knockout competition where only the champion of each national league, and possibly the winner of the previous competition, were allowed to enter. Straight knockout entails a great degree of risk for bigger clubs, as they are not sheltered from a bad game, or an elimination on penalties. However, the financial stakes back then were not as high as they are now because of two big limits on revenues. First, the number of bidders for TV rights was smaller and essentially limited to public TV broadcasters; the number of private TV channels was nowhere near what we see today. Second, the market for football players was subjected to the equivalent of massive import quotas, as clubs were not allowed to field more than three foreign players in their team. For European competitions, Welsh, Scottish or Northern Irish players playing in English teams were even considered as foreigners and therefore included in the quota of foreign players. Hence, the demand for players was smaller because only few foreign players could actually employed, and salaries were also much lower. Besides, the bargaining power of players was also limited and the balance tipped towards their employers, since they needed the agreement of their club to leave, providing a transfer fee even if their contract was ended. This would change dramatically with the Bosman ruling, which completely transformed the face of European football. Jean Marc Bosman was a Belgian player whose contract with Belgian club RC Liege had expired in 1990, and wanted to move to the French side FC Dunkirk. However, Dunkirk refused to pay the transfer fee asked by Liege, and Bosman was left unemployed. Bosman took his case to the European Court of Justice, which ruled in 1996 that the restrictions on the number of foreign players in European football clubs contravened to the principle of free movement of workers in the European Union, and that the payment of transfer fees when players’ contracts had expired was illegal. The implications of this ruling have been massive. First, the best – and richest – clubs now had access to all the best European players, contributing to a massive take-off in the attractiveness and revenues or the best football leagues – England being the prominent case – but also to a massive concentration of talent in a few very rich leagues. The best players in each European league could now move freely to the richest leagues in pursuit of higher salaries. While a team like Ajax Amsterdam was able to win the Champions league in 1995 and reach the final in 1996 with a pool of almost exclusively home-bred players (Davids, Kluivert, Frank & Ronald de Boer, Rijkaard, Seedorf, Overmars and others), after Bosman it has become increasingly difficult for a team like this to retain its excellent young players for long in the face of the much higher salaries that British or Spanish clubs are ready to pay for them. Before Bosman, the demand for young foreign players was limited because clubs couldn’t make them all play anyway. Nowadays, teams such as Chelsea or Arsenal regularly field teams with no or very few British players, and regularly recruit very young foreign players even before they have played for the professional clubs that have formed them. The increase in demand for foreign players contributed to the skyrocketing salaries of the best players, as the demand was no longer limited by quotas. Moreover, the scrapping of out-of-contract transfer fees gave more power to players and their agents to negotiate higher salaries and sign-in fees, agents taking a cut in ever bigger deals. Before Bosman, players could not threaten their employer to leave at the end of their contract; after Bosman, players could ask higher salaries in order to stay. In 1996, the world’s biggest transfer was Alan Shearer’s 15 million GBP move from Blackburn to Newcastle. In 2013, Gareth Bale moved from Tottenham to Real Madrid for nearly six times that amount (86 million GBP). With the increasing attractiveness of the bigger leagues able to recruit the best players and the multiplication of private TV channels competing for TV rights, there was a lot more money to be made in the football business than in the past, but also much bigger salaries to be paid to star players. In 2013, Premier League clubs paid 1.6bn GBP in players’ wages, while the TV rights of the Champions League for Britain were acquired for 1bn GBP by BT sports, a branch of the privatised former telephone monopoly, thereby outbidding Sky and ITV. From the late 1990s, the Champions League was to become the most lucrative European competition precisely because it would be the place where all the best clubs from the richest leagues would play against each other, and therefore where the most expensive TV rights could be sold. Now, restricting access to the competition to only one club per country meant a severe loss of potential revenue for many of the big clubs in Spain, England, Italy or Germany, especially since they needed these revenues to pay the skyrocketing salaries of star players. Hence, they needed to guarantee their steady participation in the CL bonanza. In order to defend their interests, the richest clubs formed the “G14” in 2000, a lobby group whose aim was to put pressure on the UEFA and FIFA on behalf of the big clubs, for instance by forcing them to pay the salaries of their players while playing for international competitions such as the World Cup or the Euro. In this context, the G14 also wanted better guarantees to participate in the lucrative Champions League. A major lever of blackmail was the threat to form its own closed international competition gathering all the major clubs, as outlined in a policy document leaked in 2006. Such a model is already practiced in European Basketball: the “Turkish Airlines© Euroleague Basketball”, for instance, the basketball equivalent of the UEFA Champions League, works with a system of licenses where 13 rich teams are guaranteed to take part in the league more or less independently of their national performance, a bit like the US system of franchises in the NBA or NFL. Basically, the Euroleague model is what the richest football clubs threatened to do in order to guarantee their TV revenues: if they weren’t granted more spots in the Champions League, they would go and form their own European League where Barcelona, Real, Manchester, AC Milan or Arsenal would play against each other, deserting official UEFA competitions and basically emptying them from their interest. Now, a compromise could be found in the new memorandum of understanding between the UEFA and ECA which runs until 2018, but beyond that, the creation of a closed European super league may become a reality, as acknowledged by Istanbul’s Galatasaray Chairman in October 2013. So far, threats of exit by the richest clubs have contributed to increase their power within the UEFA and increase their representation in the competition. In the long term, however, an actual exit and the creation of a closed European super-rich, super-league may enable them to manage their own revenues. In the even longer term, and since the multiplication of games per season has been a major concern for clubs, one could even imagine the disappearance of national leagues, or national leagues devoid of the best teams, who could play a season-long championship against the best teams from other countries. In the future, it could not only be near- impossible for teams such as Steaua Bucarest or Red Star Belgrade to win the Champions league, but plain impossible because they wouldn’t be allowed to take part in the first place. Is there a political economy of football? This entry was posted in Political Science, Uncategorized and tagged Champions League, exit, football, Hirschman, loyalty, UEFA, voice on May 19, 2014 by alexandre afonso. It’s that time of year again: conference season. Great opportunities for academic exchange in different guises: presenting your work and hearing about the work of others, but also multiple venues for socialising, schmoozing and networking. Making the right connections may help you get that publication out, obtain that next job, and open the doors of success, glory and wealth. For young and ambitious academics eager to distribute their stack of business cards, however, networking is not such a straightforward task: identifying targets for socialising can be tricky. Time is limited, and the aspect of people cannot be taken as a proxy for their value and usefulness, so it is difficult to make rational decisions. You may spend too much time talking to people working at no-name universities or even worse, PhD students, while missing out on the editor of some prominent journal specialising in non-parametric methods. It is easy to identify unsuccessful social interactions ex post when people regularly browse their surroundings while talking to a particular person, looking for an opportunity to escape. The main problem is that interacting with actual human beings is a much more messy business than the safe, precise, clean and predicable environment of statistical analysis. In the comfortable zone surrounding your computer, everything can be measured, quantified and ordered in a limited number of variables. Now there is no reason why the safety in numbers that many political scientists find in front of their computers could not be extended to social interactions at conferences. A fairly straightforward way to reduce this uncertainty would be to attribute a score – corresponding for instance to people’s H-index – that conference participants would display on a giant shield. This would signal whether it is worth socialising with them or not. For a more technological solution, participants could also display a barcode on their foreheads that special readers could link to their Google scholar profile; one could also imagine a detector that would beep at closer intervals upon approaching a prominent political scientists, like a Geiger counter. Technology opens endless possibilities. My favourite low-tech solution would be to physically signal the status of participants by specific pieces of clothing such as hats. Academics with lots of publications would wear giants hats. Their size would be proportional to their status. Different disciplines could also be signalled by different colour codes: green for international relations, red for comparative politics, and so on. The problem with this system is that prominent but very short academics would probably be laughed at, and therefore fail to receive the respect that their status deserves. In order to solve this problem, we could also use stilts instead of hats, so that really big shots would gravitate high above everybody else, closer to the stars. This entry was posted in Modest proposal, Political Science and tagged conferences, Geiger counter, political science, professional development on June 22, 2013 by alexandre afonso.